RUSH: This is Dave in Colorado Springs. Hi. RUSH: Fine, sir. Thank you very much for calling. CALLER: It is always such an honor to talk to you. Hey, I had a question that I’ve been thinking about for a long time, and, you know, if you look at the last couple elections, the country’s divided 50-50 conservative-communist. I particularly believe that we are the majority and we actually outnumber them. For the sake of argument, let’s say the country is 50-50. There’s one relatively conservative TV station, Fox News. But you have to pay for that. All the rest are communist liberal stations. And obviously there’s a lot of money to make in conservative talk radio. Look at your show. Fox News does better than all the rest of the communist liberal TV stations. But there’s none other. And my question is, why are there no other conservative TV stations? RUSH: It’s a question that I am asked frequently, and because I’m asked frequently, I’ve had to think about it. And the umbrella answer is, I don’t know. I’m like everybody else; I would have to guess. I can only guess on the limited knowledge I have of the people you’re talking about. The first thing to understand is that mainstream media is not individually owned. It’s corporate owned, and it has a tradition dating back to the invention of radio and TV. It’s that old. Bill Paley started CBS, David Sarnoff, RCA became NBC, and Leonard Goldenson later on brought along ABC. And all of those things developed as corporate entities. Edward R. Murrow was the closest thing to an individual entrepreneur because of his relationship with Paley. As the corporations that owned these news divisions grew, the news divisions became less and less important to the bottom line, because these corporations began to buy hardware companies. Like RCA, David Sarnoff actually invented radio to sell radios. That was his objective. William Paley, he came from a tobacco store family in Philadelphia. These corporations grew and grew, and when they got into TV and started buying the means of production, studios and so forth and so on, the news divisions of the corporations became less and less central to the profit line on the balance sheet and instead became more of a boutique identity. This is how CBS came to be known as the Tiffany network. It was supposedly the highbrow upper echelon of the elites. That reputation was established by virtue of people like Edward R. Murrow and later Walter Klondike and Harry Reasoner and Eric Sevareid. So these things just developed from the days of their invention. And they became what they were. They became places that the left educated people to go. Much like the left educates people to go to government, they educated people in journalism schools to go to media. And this is just what they became, and they became very valuable in terms of establishing a reputation for these founders. It got them all kinds of personal accolades and they were doing great work. And when they were the only thing there was, they were the only thing there was. Those three networks were it. They were it. They dominated everything. And the people that disagreed with ’em were small in number, supposedly. They were outliers. Conservatism was basically National Review, William F. Buckley and some academics. In that sense, in media, conservatism has never been mainstream, it’s never been taught as mainstream, so it doesn’t have the roots in our culture that liberalism does. But liberalism’s roots in our culture were not taught as liberalism or as socialism or as communism. They were taught as this is what is. And so conservatism has always been reactionary to this, and it’s David versus Goliath. It really is. So when you talk about doing battle, you’re talking about doing battle with multinational, gigantic, huge corporations. You gotta take on Disney if you want to take on ABC. You have to take on Comcast and everything they own if you want to take on NBC. If you want to take on CNN, you’ve got to take on Time Warner. And if there’s ever anybody using an entity as a loss leader, it’s Time Warner and allowing CNN to sit there and basically be behind teat earning nothing. But it gets them so much favor elsewhere because of their ideological tilt that they don’t have to make any money with it. They’ll make up what they’re losing in other divisions. To compete with this, you want some conservative guys to come along and pool their money and go up against corporation balance sheets and piles of money and so forth? That’s one thing. The second thing is, of the wealthy people that I’ve met who have the money to do this, they think it’s a losing proposition business-wise. And they don’t care. They’re not the ideological conservatives that you and I are to the extent that they want to lose money doing it. The second thing is — and this is really what it boils down to. The wealthy people that I know — and it’s not that many, believe me — who have the money to do this are not ideological conservatives like you and I are. Rupert Murdoch is not. He’s more conservative than anybody else, but Rupert Murdoch, he doesn’t have a problem with the current immigration system. Not like you and I do. He has objections to it, but he’s not gonna be in the fight to build a wall or any of that. He’ll support Trump for whatever reasons, but — I don’t mean to pick on Murdoch, but he’s the closest thing we’ve got, but even he is a gigantic corporate entity with all kinds of assets — newspapers, you name it. It’s not just Fox News. Fox News was the last thing in his empire that got built. But he’s sort of an exception. The wealthy people I know are more mainstream Republican. The Koch brothers would be the closest thing I know to what you’re talking about, and they’re Libertarians, when you get right down to it. And I don’t know any of them who want to own a news network to take on the Drive-By Media. I just don’t know anybody who wants to do it, anybody who has the money. Remember — and this is kind of a sobering thing, but most people in the Republican Party, in elected Republican politics, do not think that we are a country in crisis. And if they see a piece like I just shared with you, “The Great Lesson of California in America’s New Civil War,” if you run up and tell the people I’m talking about that we’re in a crisis, that the left is conducting a civil war and their objective is to wipe us out, they’re gonna think you are insane. They’re gonna think you are a lunatic, and they’re not gonna want to be seen by anybody talking to you. They think that’s straight out of kookville. They think that immigration being a problem with our culture is kookville. I’m talking about elected and donors of mainstream Republican candidates. So where is this pool of people that are gonna start buying networks to compete with the Drive-By Media? In fact, the people that you’re talking about, the wealthy people, I don’t even hear them complaining about the media much. To them, it’s just one of the obstacles in life every day that they have to overcome, but what they choose to do is deal with it. And you’ll see ’em on CNBC, granting interviews. You’ll see ’em on Fox Business granting interviews. You’ll see ’em getting all cozy with the business reporters and some of the news reporters. Their belief is, become friends with these people, get to know them, and they personally will not end up being targets. But in terms of representing an ideology — this is why alternative media is really, at its roots, an entirely entrepreneurial exercise and why it is largely copycat and emulative. Meaning once something in conservatism starts that succeeds, a lot of people, “Hey, look at that, let’s try that, we’ll do that too,” and then they jump on the fray. Conservative talk radio grows, and then from that — do not doubt me on this — there was a, “Look, conservative talk radio, let’s put that on TV,” and that became Fox News, and we’ll mix it with a hard news operation and we’ll do our Sunday show, and we’ll have our serious news, we’re gonna do talk radio on TV, we’re gonna call it Fox News. And look at it. It is far and away the number one not just cable news show, Fox News is often the most watched or in the top five of all things on cable, including USA and sci-fi or whatever the hell else people are out there watching. But for some reason, Disney doesn’t want to copy it. For some reason ESPN doesn’t want to copy it. Do you think ESPN could grow if they decided they’re gonna be political, let’s go conservative, maybe not call it that, let’s just do mainstream America. Let’s have some people on here who believe in the values of hard work and entrepreneurism and freedom and all that and have them talk about it, and let’s see if the audience like. Nope. They went hard left. They hired a hard left executive, John Skipper, and he made sure all the commentators are going hard left, and it was as though they wanted to tick off half the audience. They weren’t surprised by what happened. They knew it was gonna happen. It’s part of eliminating the opposition, to ignore it, to pretend it doesn’t exist and then to insult it day in and day out. Nobody in mainstream media has tried to copy in program and nobody in mainstream media has asked me to come do on their network what I’ve done on this one. They don’t want any part of it. Nobody is trying to emulate Fox News on cable. Even though they see how successful it is. If somebody running CNN were actual oriented in succeeding in business and watching what Fox News is doing, they’d come up their own version of it rather than beat their heads against the wall 24/7, trying to gin up hatred for Trump. But they’re not doing that, are they? The one area where media is not copycat is copying conservative success. Instead, you send people like Gore out and have him say that conservative media is aligned with Putin in an attempt here to destroy American democracy. When we are the face of and the definition of American democracy and freedom, we embody the First Amendment. They think they own it. We embody it. They and their groupthink and everybody says the same thing, reports the same thing in the same way, they think they’re the First Amendment. They’re not. They’re a bunch of sponges. They soak up whatever is conventional wisdom and regurgitate it day in and day out. The only place you can find a different way of thinking, a different way of looking at things, is right here. And nobody wants to copy it. Why? Why haven’t some of these big bucks gazillionaires that you’re talking about come to me and say, “Hey, let’s start a TV network?” It hasn’t happened. Maybe ’cause they know I don’t want to do TV. I’ve made no bones about that. But my point is it’s not as simple as having some rich guys form a network to do battle because you’re not doing battle with CNN. You’re doing battle with Time Warner. You’re not doing battle with ABC. You’re battling Mickey freaking Mouse and Disney. And last I looked, they owned the world and still climbing. 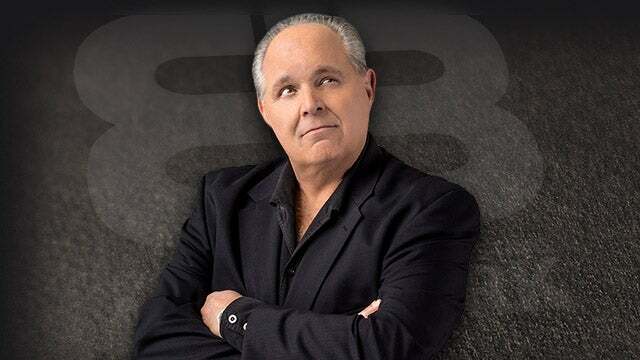 RUSH: I was not trying to depress anybody with the answer, but if somebody asks me a question, I’m gonna tell ’em what I think. But just because a bunch of wealthy conservatives don’t want to buy a network and do battle doesn’t mean anything. 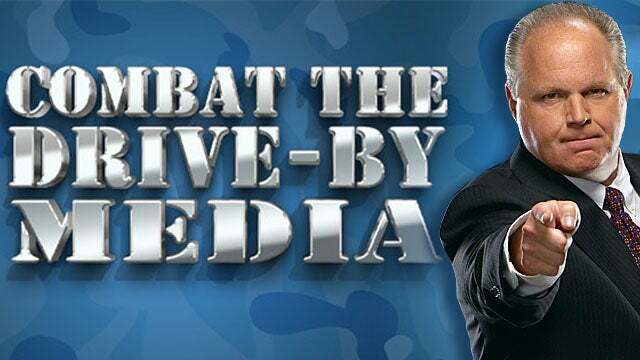 That’s not the only option to dealing with and defeating the Drive-By Media, ’cause ultimately, folks, it remains a battle for the hearts and minds of people in the end anyway. And there’s any number of ways of reaching them.